Our understanding of how the world works was fundamentally altered when the mechanical model of closed, linear systems was replaced with cybernetics and complexity theory. Sociocracy is a governance method that uses these new sciences to design organizations that are as powerful, self-organizing, and self-correcting as the natural world, including the honeybees. The United States Declaration of Independence asserts that all human beings are created equal and endowed with the unquestionable rights of life, liberty, and the pursuit of happiness. In practice, however, these rights exist only for the majority, the rich, or property owners. We the People explains how sociocracy ensures these rights to everyone. 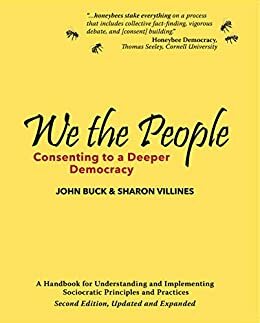 Sociocracy shares the values of democracy but designs more inclusive and efficient organizations. It makes profit-making businesses more profitable, and non-profit organizations more effective. And everyone happier. 1.0 out of 5 starsThis book is almost impossible to read. The first half is all sizzle and no substance. I tried to read this book ... I REALLY tried. But is was like listening to an academic trying to justify his expertise on his subject without disseminating any information about the subject itself. All sizzle and no meat. And boring ... boring ... B O R I N G ! I hoped to learn something from this book, but after chapters of personal histories with no useful information ... I finally gave up. If there is useful information to be had, these authors need to hire a writer to rewrite this book. Get rid of the academic justification bullsh*t and tell us what you know about your new improved democratic governance. We want to know. We really do, but you have to give us real information somewhere in the beginning of the book to keep us reading until the end. 2.0 out of 5 starsDon't waste your money on the Kindle edition; buy the book. I have not finished reading the book yet, so rather than the content, this is a review of the Kindle version formatting. All I can say is--buy the book instead. There are no page numbers, and the table of contents is formatted very strangely so it's hard to find things like chapter headings (!). I'm in a group that's reading this book and getting together to discuss it, and I find it really difficult to locate what sections others are reading. Also, the Kindle version does not have any of the charts or sidebars. There is a note offering a web link to see "We the People Missing Illustrations" but when I click it all I get is "It looks like nothing was found at this location. Maybe try a search?" As if I had any way of knowing what I was searching for. I wish I had bought the book instead. At this point this book has to be the best title in English on this important topic. Previously John Buck had tried to translate Endenburg's original book into English, but that did not prove a workable solution, both because of the structure of the book and the challenges of the translation. The current book is tantamount to a retelling of the Endenburg story in English, and is much more readable. Personally I do believe that the word sociocracy is a liability, in part because people react negatively to the association with socialism, never mind that it is not warranted at all, but more importantly because it simply is not a clear name. I much prefer the names of dynamic governance which some people have used, or consent management which I have favored. Be that as it may, this material is important, and as a management system, this model will only grow in importance. It is very profound indeed, both theoretically and practically, as you will only learn by practicing it. I don't mean doing a workshop. By actually implementing it in a group and going through at least a year of evolution. For all the challenges will come up, and it is only through surmounting those challenges that you learn the model works. The simple truth is that people use organizations to hide, and in a consent organization there is no place to hide. The learning process is that transparency is not a threat, but it is the solution, namely it marshalls the collective ability to adapt to change in an unprecedented way, and organizational stasis is largely avoided. Thus once an organization truly learns to work with this model, watch out. The sky is the limit! Unfortunately, this book reads like a self-help book rather than a how-to manual. The first 50 pages of the book are spent in trying to sell the reader on the idea of Sociocracy, and the last 100 pages are afterwords and appendices. leaving less than half of the 275 page book as the useful part.